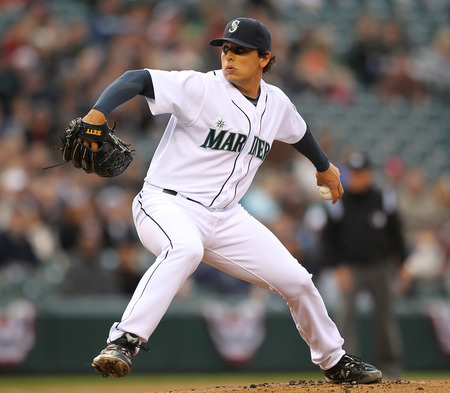 Jason Vargas was on his game from the beginning tonight. The first three batters he faced went down in order, all via the strikeout. Cruising through the first two innings, he ran into a little trouble in the 3rd. After giving up two singles, Brett Lawrie came to the plate and hit a double that scored both Jeff Mathis and Moises Sierra. He got out of the inning with just the two runs allowed on three hits. When he left in the 7th inning, he had only allowed a total of 5 hits. The Mariners gave him some run support early. Dustin Ackley hit the first pitch of the game into the right field seats to put the Mariners up 1 to 0. It was his 7th homer of the year. In the bottom of the 2nd, with one out, Mike Carp singled and Miguel Olivo doubled. With runners at second and third, Trayvon Robinson hit a single to center, scoring Carp and pushing Olivo to third as Robinson advanced to second on the throw. Brendan Ryan followed with a single that scored Olivo and runners were at the corners for Dustin Ackley. Ackley hit a ground ball and just avoided a double play to gather his 2nd RBI of the game as Trayvon scored from third. Mariners were up 4 to 0 after 2. With the score 4 to 2 in the bottom of the 4th, Trayvon came up again and hit a one out double. Brendan Ryan hit a single to put runners at 1st and 3rd for Dustin Ackley again. Ackley grounded out again and was safe at first on a fielders choice for the second time as he tallied his 3rd RBI. Mariners 5 - Jays 0. In the bottom of the 5th, Miguel Olivo came through with a single to center field that scored both Michael Saunders and Kyle Seager. Olivo had two hits today. The Mariners were up by 5 and that would be enough as Vargas and the bullpen strolled on to hold the Jays to just 6 hits through the nine innings. Josh Kinney came out to pitch the ninth inning and mowed down the Blue Jays in order. Striking out the side and slamming the door shut and sending the Mariners to their 6th straight victory. The Mariners have been playing great baseball as of late. I don't want to make any claims just yet, but it seems that Ichiro's absence has changed the dynamic of this team. Or, it could be that it's finally a little bit warmer here now. It could be the fact that we have faced a lot of sub par pitching, but even when we faced terrible pitchers previously in the season we've failed in comparison. Hence the perfect game by Philip Humber that still haunts me. It could very well be that we've just gained some serious confidence after hitting really well in Kansas City and we finally found a way to bottle it and take it back home. Whichever way you may want to answer that, I just know that I like the results and I hope that we can keep it up. One more game against the Jays tomorrow to try and go for the second straight sweep and our 7th consecutive win. Tomorrow may be the day when we get to see the debuts of Eric Thames and Carter Capps. Tomorrow may be the day that we get to kick all these Blue Jays fans out of Safeco Field. Nothing worse than feeling like your on the road in your own stadium.